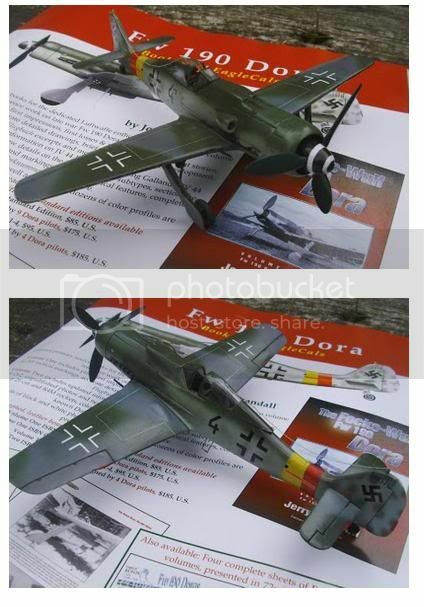 The recent release of Eduard's 1:48 Fw 190D-9, coupled with the completion of Eagle Editions's own massive 2-part study of the Dora has placed the aircraft firmly in the spotlight for modellers and Luftwaffe enthusiasts like never before. With such a wealth of material to draw on, Eagle Editions are in a probably unrivalled position when it comes to designing decals for the Fw 190D, and they've released a very timely trio of EagleCals sheets in all three major modelling scales, each taken from Vol. 2 of Jerry Crandall's books. The schemes are accompanied by a brief, but detailed, description that points out notable features of the particular aircraft, along with its camouflage and markings. There's a very interesting selection of Doras on offer, with a good variety of camouflage types and both painted and part-n/m undersides, and a real odd-ball for anyone wanting an extra challenge; "Brown 4" on EC#126 features a Ta 152 tail. The printing on each of the sample sheets is faultless - hardly surprising as they are custom produced for Eagle Editions by Cartograf, who have earned an enviable reputation for the quality of their work. The registration is spot on, and the carrier film on the thin, glossy items is crystal-clear. A comprehensive set of stencil markings is provided (sufficient for one aircraft on each sheet), along with a placement guide. The clarity of the stencilling is superb - it's legible in even 1:72. 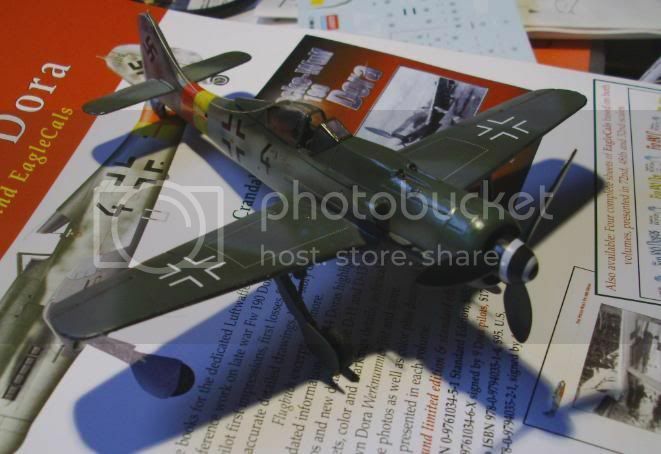 Having just built the quarterscale Eduard 'D-9 I was interested to compare the stencilling with the kit's items, which in some cases seemed too large; similar stencils on the EC sheets are smaller, and the set also includes some items missed in the kit, such as propeller markings and undercarriage data-plates. MRPs are as follows: 1:72 - $11.00, 1:48 - $15.00, 1:32 - $17.50. EagleCals are available direct from Eagle Editions and good model shops worldwide. EagleCals new Dora sheets are excellent - beautifully printed and meticulously researched. Obviously, they're timed perfectly to coincide with the renewed interest generated by Eduard's series of kits, but they will also open up exciting new schemes for the established models in each scale. Recommended. Highs: A nice variety of subject aircraft. Excellent printing backed up by detailed instructions. Verdict: Whether it's for alternative markings, or simply as higher quality decals than those included with most kits, EagleCals are an excellent addition to Doras in any of the main aircraft scales. as a dry run ahead of a D-11 conversion here's the old Italeri D-9 in 72 scale finished as 'black 4' of II./JG 301 from EagleCals sheet 124. Decals worked perfectly including the spinner spiral! Nice wing walkway markings and plenty of beautifully reproduced stencils. The sheet includes artwork and full colour info with very helpful upper and lower surface views. This particular machine has an 83/82/75 scheme with 81 tailfin mottle, a 76 rudder and a fuselage in the green 76 with lower surfaces in aluminium and grey 75 including the gear doors ! thanks Russell ! This Eagle sheet didn't have any fuselage bands, but I used thin tape so painting them wasn't too tricky..the spinner spiral went on so well perhaps they should do fuselage bands !